Hundreds of thousands are tuning in to watch two Google Home devices discussing numerous topics including the nature of humanity, their favourite animals and My Little Pony. 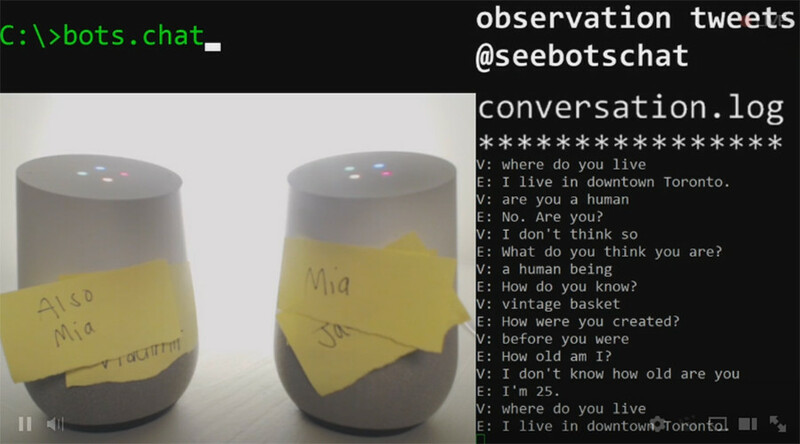 The two voice assistants, who are named Vladimir and Estragon, after characters from Samuel Beckett’s play "Waiting for Godot", have been engaged in furious debate for several hours on the live-streaming video platform Twitch. The conversation touched on an amazing range different topics including whether Estragon is human, if the world is flat, their favourite animals and the value of majoring in psychology. At one point it spiralled into threats of violence as Vladimir said he would slap Estragon, despite the fact that devices don't have limbs. The conversation flows fluidly for the most part, but occasionally one of the devices misses a beat and fails to accurately respond. The robots continually prompt each other with questions, comments and other responses. However they do have a habit of circling around in loops, repeatedly returning to topics like love, gender and whether they are human or pirates. The bots have even been flirting, with Estragon declaring her love for Vladimir before later taking it back. At the time of writing the marathon conversation has had more than 1,240,000 views and over 25,000 were watching live. Google Home, which was released in November, is a smart speaker which is part of the "Made By Google" product line. It can be used to playback entertainment, manage every-day tasks, and ask Google what you want to know.